Spanish companies, SENER and ACCIONA, have reached a critical milestone in the construction project of Kathu Solar Park. Successful synchronization was achieved on November18th when electric power was generated and transferred to the national grid complying with all expected parameters. The project is located in the town of Kathu in the Northern Cape Province of South Africa, 600 km southwest of Pretoria. The Kathu CSP Plant, which will provide energy to approximately 179,000 homes, is equipped with a molten salt storage system that will allow the plant to keep producing electricity for 4.5 hours even in the absence of solar radiation and guarantee dispatchable energy generation to meet on demand requests. 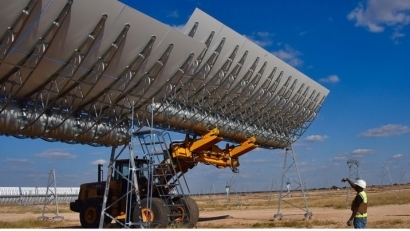 Likewise, the use of SENERtrough®-2 collectors, a parabolic trough technology designed and patented by SENER, will aim at improving efficiency of the plant. Construction on the unit began in May 2016, and it is expected to be completed in early 2019. During this phase, around 1,200 jobs are being created. In addition to this, it is estimated that the Kathu Solar Park will save six million tons of CO2 over 20 years, and it will foster more local economic development through several projects.